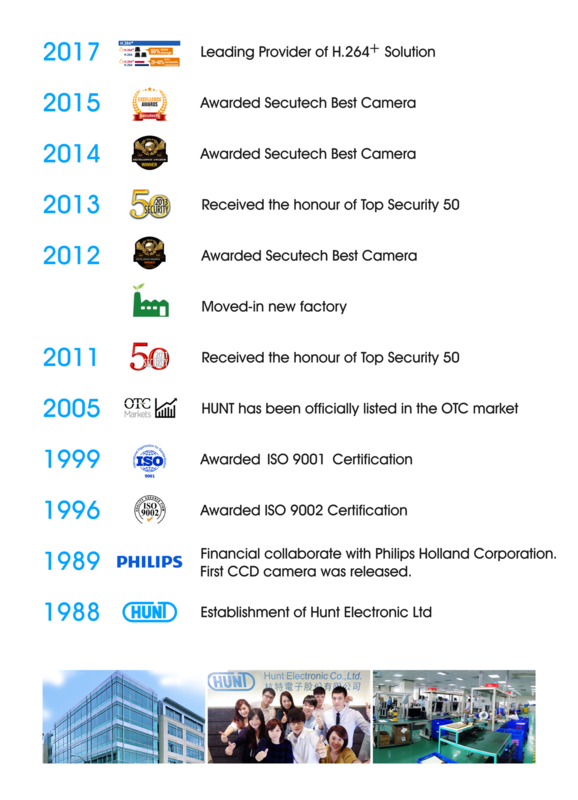 About Us | HUNT ELECTRONIC CO., LTD.
Hunt Electronic Co., Ltd is one of the leading surveillance solution system manufacturers in Taiwan. Established in 1988, we began our profession with a solid foundation in CCTV industry, and then gradually stepped into network surveillance for the rapid and extensive use of Internet technology. We aim to provide the best video security solution for our OEM & ODM clients. Along with the acquirement of our implemented ISO 9001 National Quality Management Standard, we have earned our way to the OTC market and met more opportunity for greater expansion and interaction with the demanding market in 2005. Since 2008, we have received the honour of Top Security 50 from an International Publisher for 4 consecutive years, which signifies our achievement after years of hard work in the surveillance field. Being a top IP surveillance solution provider in Taiwan with a global vision, we set our goals to pursue and fulfil not only our business potential, but also help creating a better world of secured environments for everyone.